Have you seen those posts on social media? Or maybe you’ve seen stories on the news or gotten ” professional advice” from your doctor about bad “screens” are? Various sources rant about how people nowadays “always” have their nose buried in their electronics, “never” talk to each other face to face anymore, and make you feel guilty for how life is passing you by while you sit staring at your phone or tablet. Well, I’m not one who buys into a lot of hype and I feel like that’s what a lot of this is. After all, screens are not the only thing humans have ever had their nose buried in. Take the picture below for example, time and people and things and life is passing these people by while they stare at a piece of paper. Not only are these people not talking as they sit right next to each other, they probably didn’t communicate much at all by any other means either. Today, however, we can have our face buried in our mobile devices AND still communicate with each other. Why do we often choose to only see or focus on the negative? I know I learn more, communicate more, interact more, and get news more with modern technology than we would without it. I’m sure I’m not the only one. I’m also able to connect with and get support from others with similar interests, challenges, views, etc like never before. Let’s face it, if it weren’t for today’s technology, you wouldn’t be reading this article. There’s no way I ‘d go traveling around to spread my ideas in person via speeches or other face to face means (I don’t really care to be up in front of people lol). There’s no way I’d spend hours upon hours writing up thoughts to share in hopes that some of it gets published in a magazine or other periodical. Today’s technology enables me to share thoughts and ideas with you quickly, easily , and for very little cost. On top of that, I probably reach more people than if all I had were “old fashioned” means of communication available to me. In any case, we tend to blame “things” (like new technology, which usually isn’t “good” or “bad” in and of itself) for unwanted behaviors/results that really aren’t the “thing’s” fault. We blame money for people’s greed. We blame social media for “drama.” Some blame “competition” for cheating and so on and so forth. How are you going to fix the actual problem if you keep placing blame on something that is “value neutral” (meaning that thing is neither good or bad until you choose to use it in a good way or in a harmful way)? I remember not too long ago, people got criticized for having their noses buried in books all the time. Now people wish kids would read books more instead of play on their iThings. 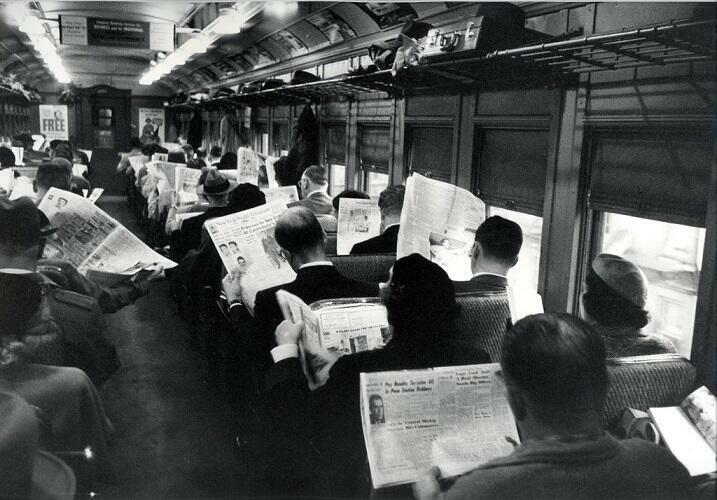 Screens are not as passive or “mindless” as they used to be. I’m sure the next generation will wish their kids would spend more time learning and communicating on their iThings instead of spending countless hours on whatever the next “thing” is. Johannes Trithemeus lamented that the advent of the printing press would make monks lazy, damning them to hell. It would also apparently make people stupid because the only way to understand words was to write them out yourself. In 1950 educators railed against the invention of the ballpoint pen because it would ruin education, lead to spendthriftiness, and cause ruinous waste and financial excess. The pencil was apparently going to lead to carelessness and the end of permanent memory in humanity. Telephones would turn our brains to jelly. Nearly every advance in communication media has been met with long campaigns of controversy. Many of the complaints we hear now about “screens” are just revamps of old criticisms of other inventions. Many of those old criticisms even had “scientific research” to back them up just like today’s arguments against too much screen time. In other words, even if you remove the “thing” you think is “bad” something else is likely to take it’s place because it’s not the “thing” (or lack of it) that’s the problem. The problem lies in how you use or perceive that thing. The cool thing is YOU control that and can CHANGE it for the better right now. Like anything else, how you choose to use anything in your life is YOUR choice. Work on making better (notice I didn’t say perfect) choices and you transform the way any “thing” impacts your life. Where are you doing this in your life or in your softball? Where are you blaming the “thing” instead of attacking the root of the problem? How can you change your perspective to improve your results? How can you tweak your mindset or your current outlook and improve despite “things” or “distractions” or “challenges” around you? How can you better use what you have to improve your game/your life? Focus more on making the most of what you DO have vs spending time and energy wishing for what you don’t. Complaining or wishing for magic bullets that fix your problems for you doesn’t work. Use your time and energy focusing on solutions. Get creative. Change your mindset, change your perspective so it helps you move forward instead of holding you back. Change what you focus on so you use what you have in the most productive ways instead of in unproductive ways. This doesn’t cost you anything and it can produce better results starting TODAY! 1 Pings/Trackbacks for "How to get better faster, for free"